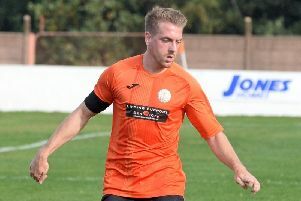 It has been a tough week for Rossington Main with back-to-back defeats but Lee Holmes’ men did still show there is some light at the end of the tunnel. Main went out of the League Cup in midweek, beaten 2-1 at Premier Division side Barton Town Old Boys. Rossington trailed 2-0 inside the opening 22 minutes to a contentious penalty and a rocket of a shot. But Matt Bradley deservedly pulled one back in 76th minute to leave the hosts hanging on. Last weekend Main went down by the same scoreline against a well-fancied Hull United outfit at Oxford Street despite taking an early lead. There was an early scare for Rossington when central defender Jordan Woodhall deflected a shot onto his own post. But it was Main who edged in front in the 12th minute, Liam Cooper netting from close range after Bradley struck one across the face of goal. Hull hit back to equalise nine minutes later. There was an element of good fortune about the goal as a cross from the right went in off the unfortunate Woodhall. Rossington lost goalkeeper Simon Dye to injury three minutes from the interval but the hosts at least had a reserve keeper on the bench in Matthew Leese. Leese was soon in the thick of the action, saving a deflected shot from distance. Hull made a bright start to the second half and took the lead on 61 minutes when a cross into the box was only half cleared to Matty Start, who sent a acrobatic overhead kick looping over Leese. Cooper headed just wide from a Jason Stokes free-kick as Main looked to get back on level terms, but it took a great save from Leese to push a header onto the crossbar to prevent Hull grabbing a late third. Rossington, who are 18th in Division One, travel to Selby Town on Saturday. Town picked up a creditable 3-3 draw at AFC Emley in their last outing but have lost four of the last six. Next Tuesday Holmes’ side face what is surely a must-win game at next to bottom Grimsby Borough. Borough have just one win and five points from 19 outings to their name.